For the last product I'll be reviewing for this month's BNT Beauty Box, it's the Comelyco Aloe 95% Gel. I'm probably the last BNTGirl to do a review on this product and the others have sung high praises on this particular product but I've been holding it back and saving it for last because I was putting it through some tough experiment (well, probably not that tough, but you get my gist). This product contains 95% organic aloe from Jeju, an island in Korea. This has no artificial colors, parabens, benzophenone, animal raw materials, PG, PEG and formaldehyde. Aloe is just one of nature's gifts to us and it has so many uses and benefits. Among the probably endless list it is particularly known for are calming irritated skin, cooling sunburn, hydrating skin and scalp, reduces wrinkles, improves scars and good for digestion (when ingested). The gel is clear, no added coloring, unlike some of the aloe gel products in the market that I've seen. The tub typically smells like a freshly cut aloe which is very relaxing to me. The gel formula isn't too thick as well and nicely settles on the skin. My fellow BNT Girls Kim and Carina have a pretty good list of what you can do with this product but I was only concerned on proving 3 things: skin hydration, skin smoothing and improvement of scars. I've also seen Doris's review on this and how it greatly smoothed out her skin in 3 days so I was really positive about the results. For a good week, I've tried using it as a night time moisturizer and as a sleeping pack. After that I came to the conclusion that I sort of didn't like it. I'm not saying the product is bad, quite the contrary, it is very much effective in terms of hydration although I just don't like how it felt on my skin. Upon gel application, it is very cooling and soothing on the skin. I could feel myself relaxing. Using it as a sleeping pack, I applied a thicker amount of product on my skin, it took about 15 minutes for my skin to fully absorb it. Here's the thing I didn't like about it, whether used as a moisturizer, which I applied thinly, or as a pack, applied thickly, I don't like the tightening effect it has on my skin. Sure my face felt very smooth to touch but I so badly wanted to wash off my face because it doesn't feel like my face at all. I don't even know if I'm explaining this properly but I hope you get my drift here. My skin felt hydrated and dry at the same time. Ironic but that's how it felt to me. I think I'm used to feeling really hydrated when I notice my skin producing a little bit of oil especially because I have normally dry skin. In the next experiment I wanted to see how well it would smooth out the bumps on my arms and improve my week old burn. I have been cooking a lot lately and I mindlessly touched a hot pot. Also, on the area where I had the burn, I've noticed a few bumps on the skin which I desperately wanted to get rid of. For 7 days I religiously applied the aloe gel on the area, day and night. At the end of 7 days I was fairly surprised on how light the scar has gotten and how the bumps and redness on my arms had smoothed out. The scar is pretty much still there but it has indeed greatly improved. My body is pretty bad with scarring because it would take me a long time to get rid of such. Most of the time it would take me an entire year to get rid of a small burn and probably a good 2-3 months for an acne scar. 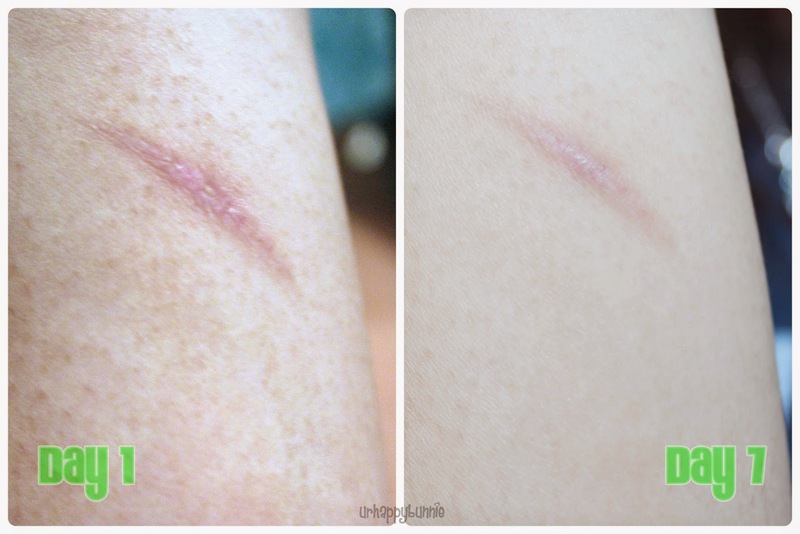 Seeing the improvement of the scar in just 7 days is pretty much amazing to me. I really like this product for calming my skin and scar improvement. I see this as another summer must-have for when my skin is badly burnt. I'm not so fond of this as a moisturizer although it does a pretty good job of skin tightening so it helps in preventing and improving wrinkles. I have also resulted to using this as a wash off mask instead of a sleeping mask. I really just can't stand having a tight face throughout the night. Overall, I give this product an 8/10! If you come across aloe products, give it a chance and try it out, you just might like it and it might help you solve your beauty and body problems because of it's benefits and uses.